Bleach is a best-selling manga and anime series. The manga, authored by Tite Kubo (久保 帯人), has been published in a Japanese magazine Shonen Jump since August 2001. It has grown to been very popular to many people around the world. The manga series has a very unique story to it. The central character of Bleach is a fifteen years old schoolboy Kurosaki Ichigo, who has the ability to see and communicate with ghosts and spirits. He accidentally gets supernatural powers and is forced to fight with evil spirits aka Hollows (ホロウ), protect the people and send the souls of the dead in the afterlife ("Soul Society"). ...he meets Rukia Kuchiki, a Soul Reaper who shows up at Ichigo's house on the trail of a Hollow, a malevolent lost soul. Drawn to Ichigo's high level of spiritual energy, the Hollow attacks Ichigo and his family, and Rukia steps in to help, but is injured and unable to fight. As a last resort Rukia decides to transfer a part of her Soul Reaper powers to Ichigo... Ichigo, now a full-fledged Soul Reaper, and Rukia, minus her powers, join together to face the challenges that lie ahead. Bleach was awarded with Shogakukan manga award as the best shonen ("for boys") manga. The anime series, based on the manga plot, ended with episode 366. In addition, two OVAs, four animated films and several video games were released. To know more about the series, please visit Wikipedia. Kuchiki Rukia (Japanese: 朽木 ルキア) is a friend of Ichigo, and the one who had initially given him the powers of Soul Reapers (or shinigami). Rukia's history begins in Soul Society (尸魂界; Japanese for "dead spirit world"), as a child growing up in one of the poorer districts. She had been abandoned as a baby by her older sister, Hisana, and was taken in and taken care of until she was old enough to fend for herself. Her early life is defined by the company she kept, which included Abarai Renji, as they grew up stealing water in order to survive. They joined the Shinigami Academy for a chance at a better life. Though Renji appeared to be the better student, Rukia found herself with a powerful connection she never knew she had: Kuchiki Byakuya, a powerful shinigami, adopted Rukia into his noble clan, with the additional offer of early graduation. Rukia was a good student, and is a strong fighter. Her Zanpakutou (a sword) is known as Sode no Shirayuki (袖白雪; "Sleeved White Snow") and is considered to be the most beautiful of it's kind in Soul Society, released by the trigger word Mae (舞え; "Dance"). 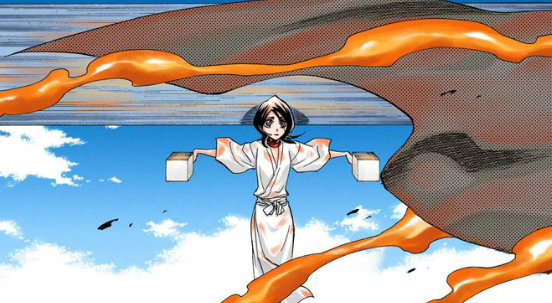 Rukia is a proud indivdual, taking advantage to appear as high and mighty when she is more knowledgable of something than another person; among Ichigo and friends, this is often having to do with spirits, while with Renji, it is human culture. Despite this attitude, she is surprisingly naive to many things, such as how to put a straw in a juice box. Kuchiki Byakuya (Japanese: 朽木 白哉) first arrived in Bleach as the silent yet powerful shinigami sent alongside Abarai Renji to find and bring Rukia back to Soul Society. 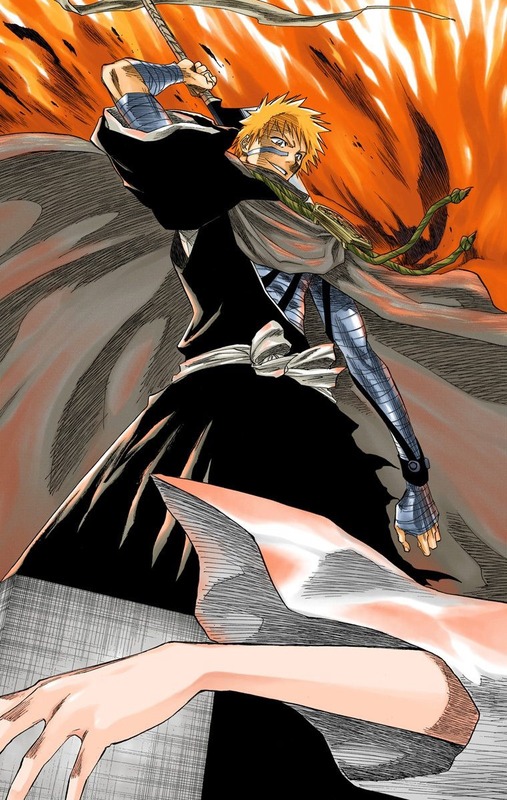 His power is immediately made evident when he steps in to aid Renji in his fight with Ichigo ending things in a matter of seconds, leaving Ichigo bladeless and lying face down on the ground with what he thought was little hope for survival; and this proves to be only the beginning of his power. His Zanpakutou's name is Senbonzakura (千本桜; "Thousand Cherry Blossoms"), it is released by the trigger word Chire (散れ; "Scatter"). 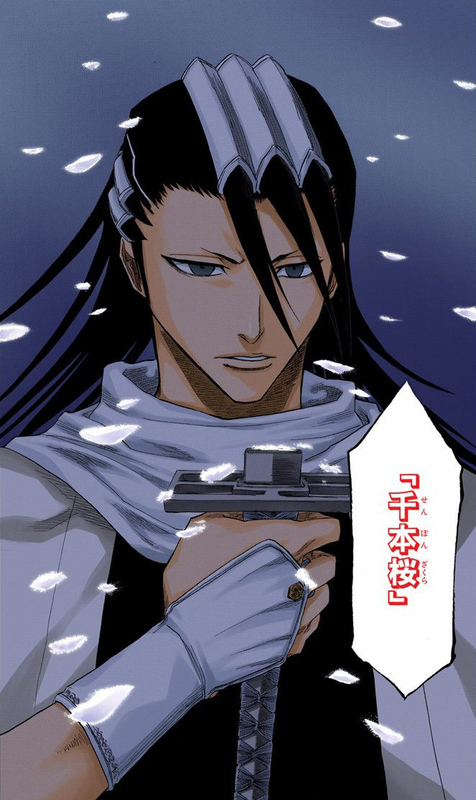 Descending from the Kuchiki clan (one of the four noble houses), the captain of the 6th division Kuchiki Byakuya is also Rukia's older brother. They are not related by blood, as Rukia was adopted in to the Kuchiki family. 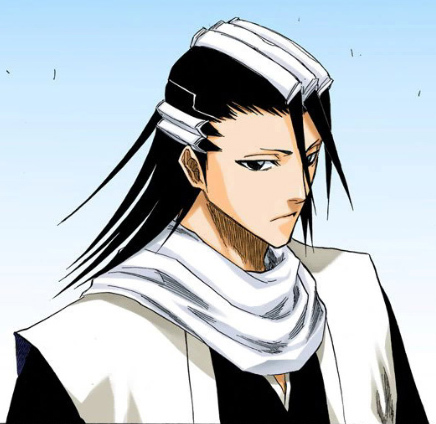 Because of his noble roots and his superior level of power, Byakuya tends to carry himself with a level of arrogance and an I’m-better-than you attitude, this is clearly seen by the quite rude and often times sarcastic manner in which he talks to most people around him. 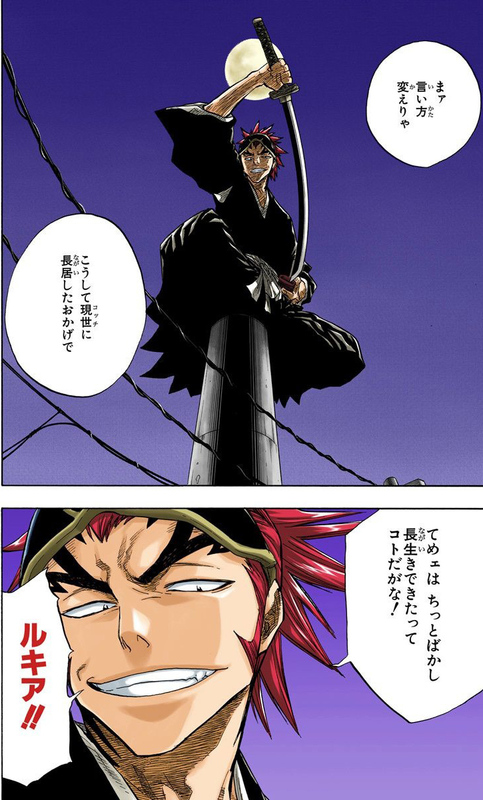 Abarai Renji is his lieutenant. 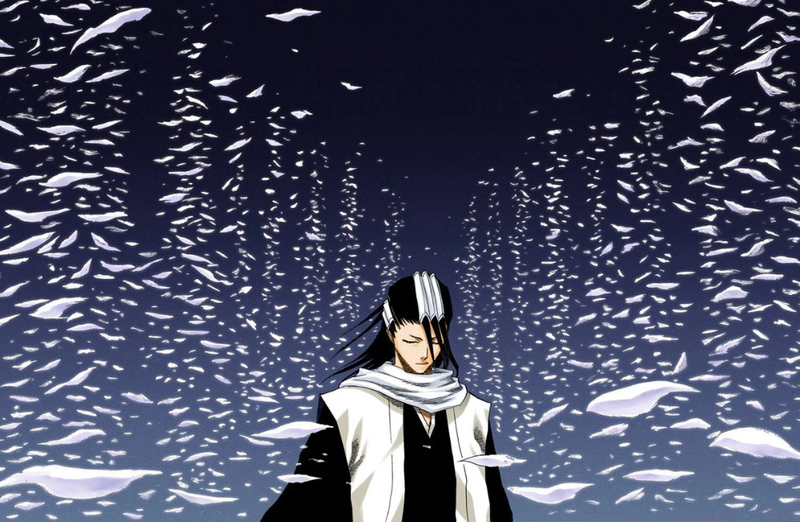 Byakuya is also a shining example of what a shingami should be as he is extremely law-abiding, this devotion to the law is also heightened by the fact that he is a descendant of a noble family. To Byakuya it is the responsibility of the nobles to lead by example ("if they do not obey the rules of Soul Society, then who will?"). Byakuya is a nobleman to the core and appears to be unflinching in his devotion to his duty even after Rukia has been sentenced to execution. In his mind, regardless of whatever conflicts he may have been feeling on the inside, his duty as nobleman and a shingami was to uphold the law; no feelings he may have would be allowed get in the way of his duty as a result of this his outer shell never cracks or shows anything other than his typically cold exterior. There have only been two occasions when Byakuya stepped out of the bounds of his noble responsibilities, firstly when he married his wife Hisana, a commoner, and secondly when he adopted Rukia into the Kuchiki family. Rukia decides to leave Ichigo. As she runs from the Kurosaki home, two shinigami appear in the night sky. The red-haired one observes her and says, "Kuchiki Rukia... We found you!" As Rukia runs, she reminisces on her experiences in the living world and her encounters with the many people she has met during her stay. She realizes that she has become too close to Ichigo and his friends and has developed feelings that would only be weaknesses for her as her job as a shinigami. 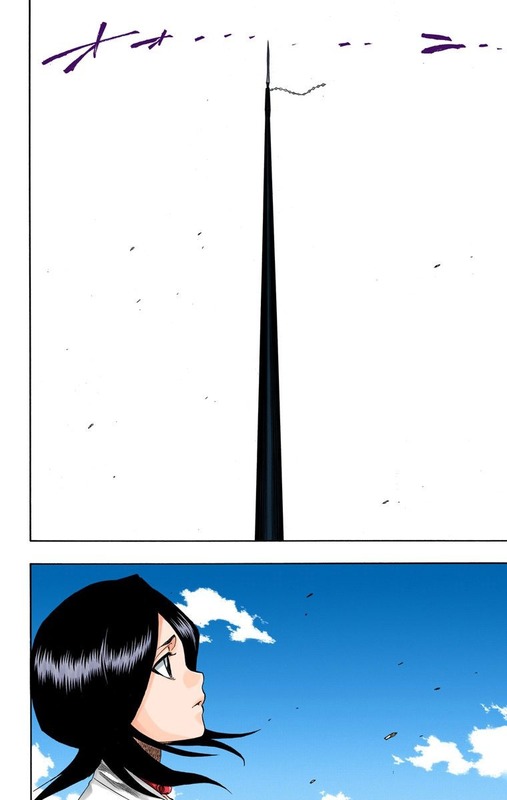 Pulling Rukia out of her reverie, a voice calls down to her from an electric wire post. A red-haired shinigami suddenly leaps down and thrusts his sword down to the ground, just barely missing Rukia and sending green light and sparks into the air between them. It's Abarai Renji (阿散井 恋次). He remarks that Rukia has gotten far too soft. Then shouldering his sword, Renji demands to know where the human who took her powers is. In other words, Ichigo. 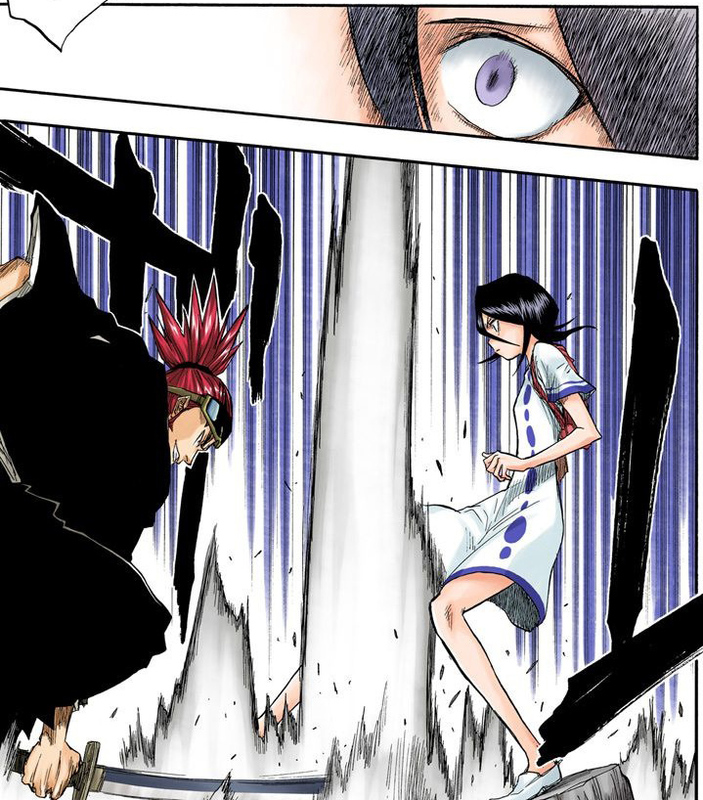 Rukia attempts to lie her way out of her situation, telling him that just because she is in a false body, she has not necessary lost her powers. Renji, however, definitely knows the truth. Renji: You're just another kid from Rukongai like me and still you were lucky enough to get taken in by the noble house of Kuchiki. With all that money and effort spent on you, weren't you supposed to become one of the Shinigami elite?! You're Kuchiki freakin' Rukia! There's no way it's right for you to wear that human expression! Ain't that right, Captain Kuchiki? 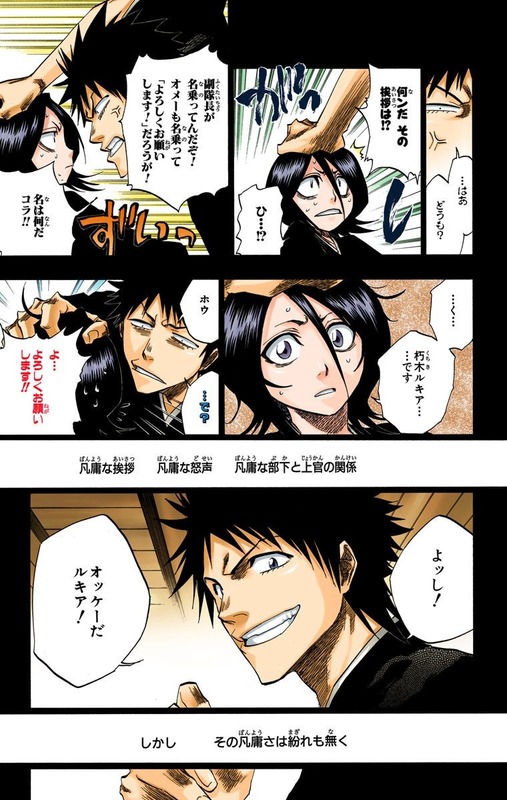 The second Shinigami appears behind Rukia, the one with dark hair. 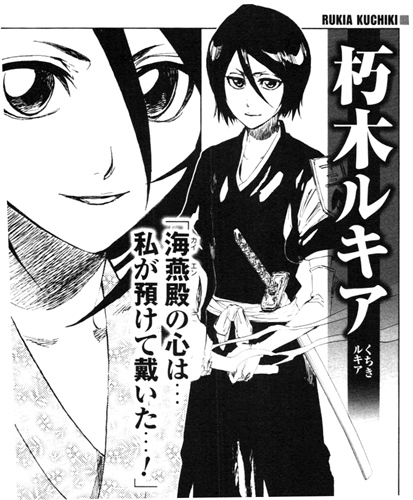 Rukia calls him Byakuya nii-sama (nii being the Japanese term for older brother). 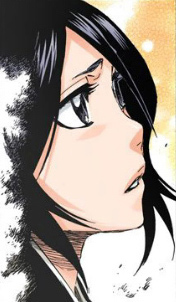 Rukia appears stunned in his presence as he simply looks down at her. 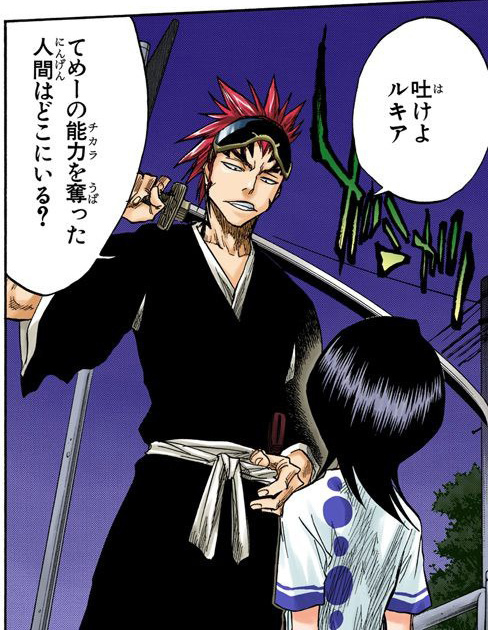 All of a sudden, Renji leaps forward and slashes at Rukia with his sword. Rukia barely manages to stay on her feet, albeit with a large cut on her right cheek and with one hand on the ground holding her up. Renji then reminds Rukia that transferring her Shinigami powers to human is a felony and the proceeds to inform her that he and Byakuya have come to arrest her and kill the one who took her powers. Ichigo arrives. 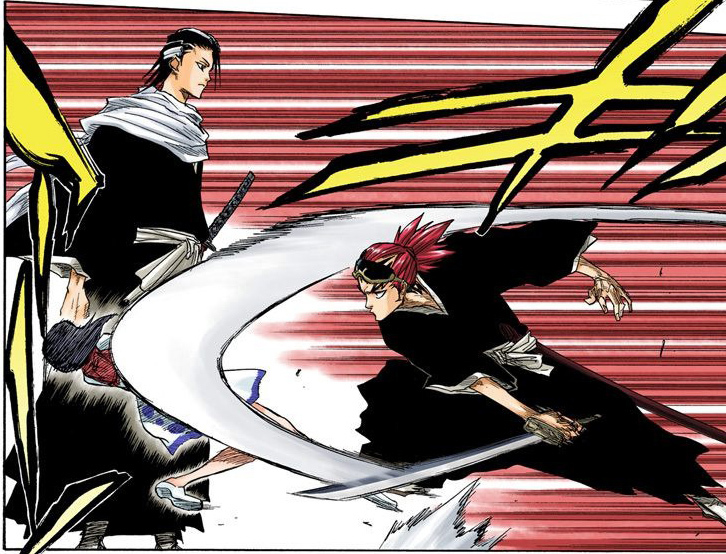 Renji realizes that he is the one who took Rukia's powers and lunges forward to attack him. As Renji stands over Ichigo, he tells Ichigo that once he kills him, Rukia will regain her powers and then will be taken back to Soul Society to die herself. Renji continues to abuse Ichigo with his words, telling Ichigo that an overnight Shinigami could never even scratch true Shinigami like himself and Byakuya. 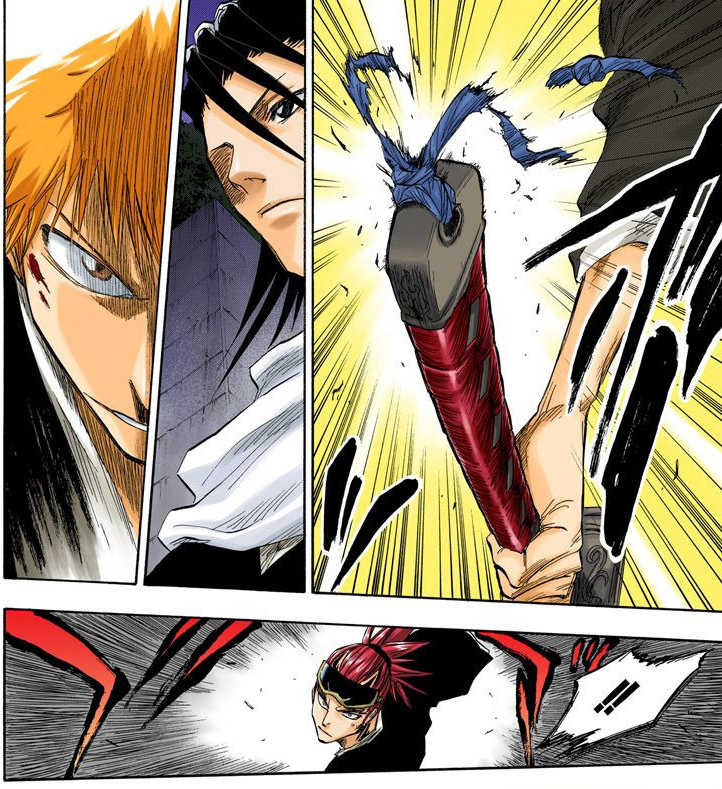 Ichigo, however, doesn't take it laying down and swipes his zanpakutou upwards, leaving a large cut on Renji's chin. He stands up again, ready to fight. 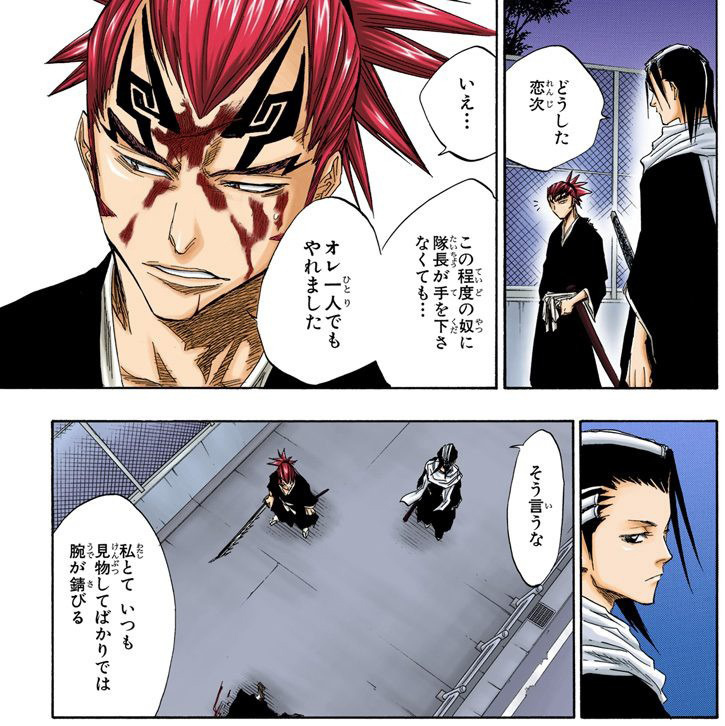 Byakuya then speaks up for the first time to lightly scold Renji that he relaxed too much. 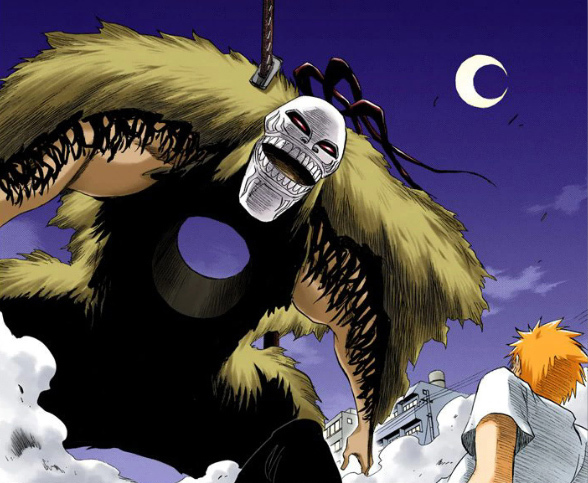 He goes on to inform Renji that he received a report on a certain Shinigami named Kurosaki Ichigo who inflicted a sword wound on a Menos Grande and sent it back to Hueco Mundo. They fight. 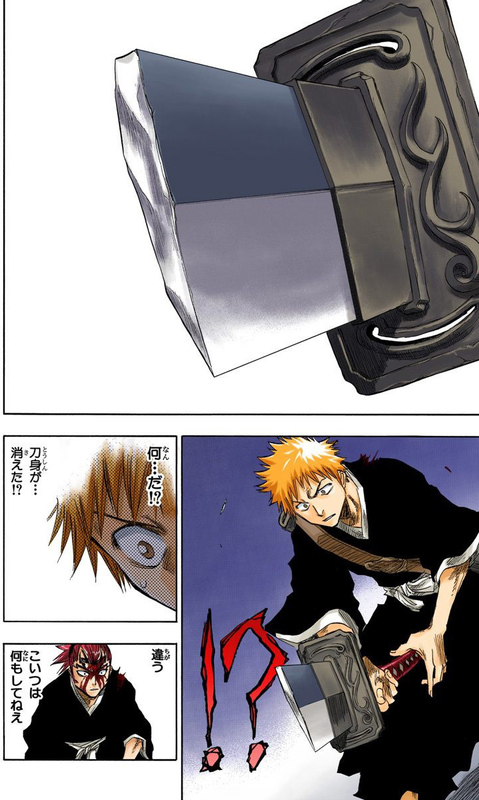 Ichigo lands on the ground and suddenly the blade of his zanpokutou has been cut off. Ichigo realizes it couldn't of been Renji, and turns to Byakuya. He is confused of how he could of done something from the distance he is standing from himself and Renji. 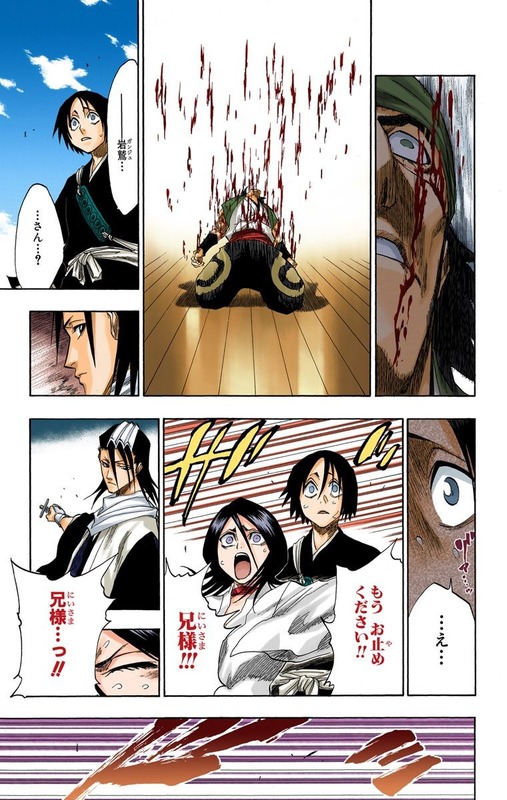 He then notices the removed blade of the zanpokutou in Byakuya's hand, as Byakuya casually drops it to the ground. 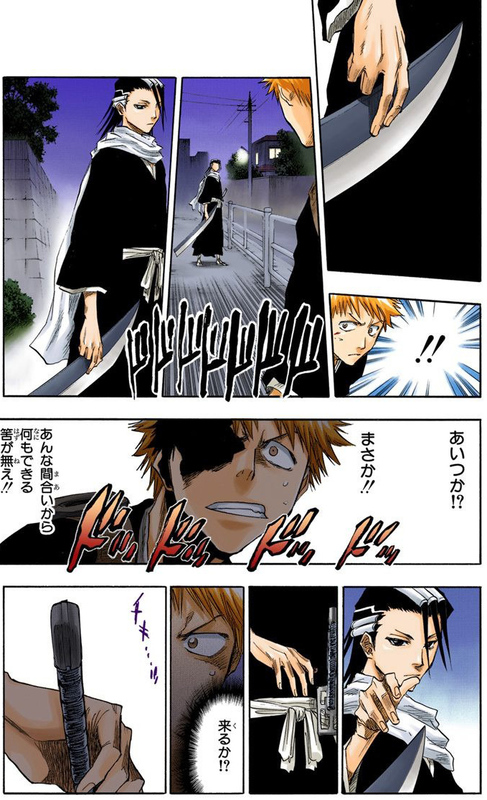 Byakuya slowly raises his hand to the handle of his sheathed zanpokutou as Ichigo readies for an attack. 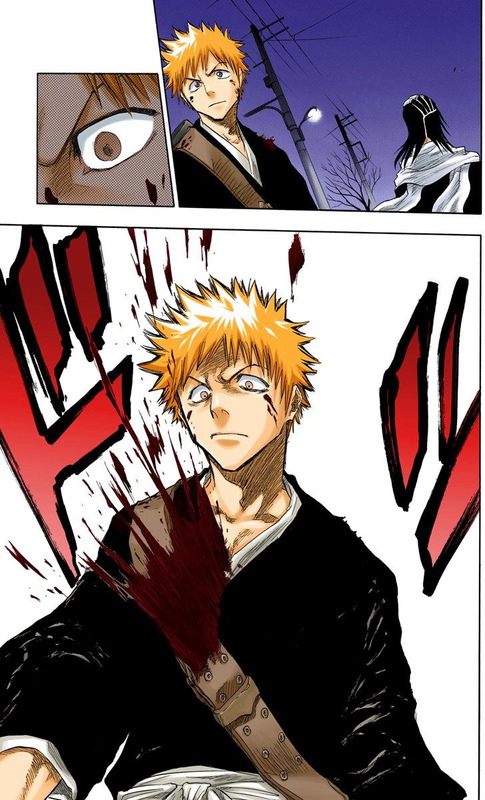 Suddenly Byakuya is behind Ichigo, who never even had a chance to react. A wound appears on Ichigo, and as he falls he has no idea what just happened, not even from what direction he was attacked from. Byakuya then appears beside him and once again attacks with lightning fast speeds, stabbing through Ichigo's back and piecing through the front of his body then quickly sheathing his sword again. 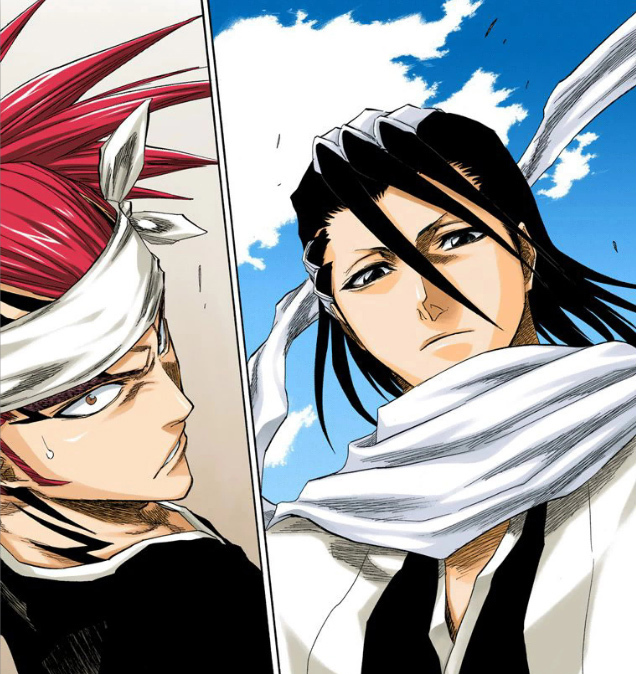 Renji claims he could of finished Ichigo of himself, but Byakuya says even his skills will get rusty if he justs stands by and watches all the time. 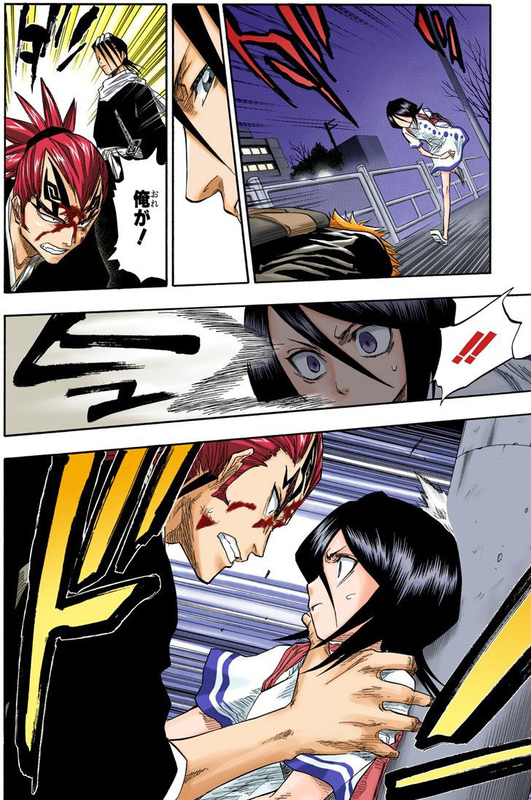 Rukia then attempts to run to Ichigo's side but Renji grabs her by the neck and pushes her up against a pole. 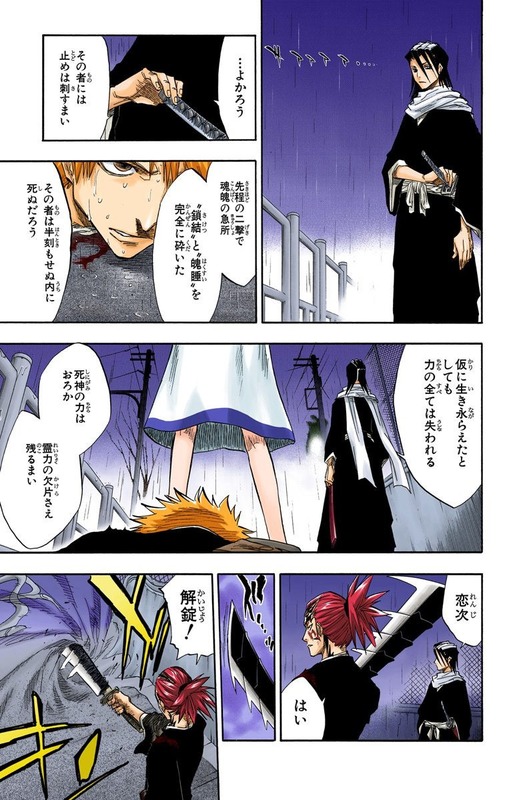 Rukia tries to get him to let go, but Renji then claims angrily that Ichigo is clearly dead. Even touching his dead body, he explains, would lengthen her sentence in prison by 20 years. Ichigo then reaches a hand out and grabs the bottom of Byakuya's clothes. Byakuya, without even looking down at him, tells Ichigo to let go, but Ichigo replies with a smirk, "I can't hear you. Look at me when you talk." Byakuya then threatens to cut off Ichigo's arm when suddenly Rukia runs up and kicks Ichigo's hand off Byakuya. Ichigo questions Rukia, and she responds, "Filthy human... How dare a filthy human seize Nii-sama's leg. Know your palce boy!" Ichigo is then shocked as Rukia starts to willingly leave with Renji and Byakuya. Ichigo questions what she is doing, and she then tells him to never think of coming after her to rescue her or she will never forgive him. Byakuya decides not to give a finishing blow as Rukia had stated would be a waste (in what was most likely an attempt to save his life). 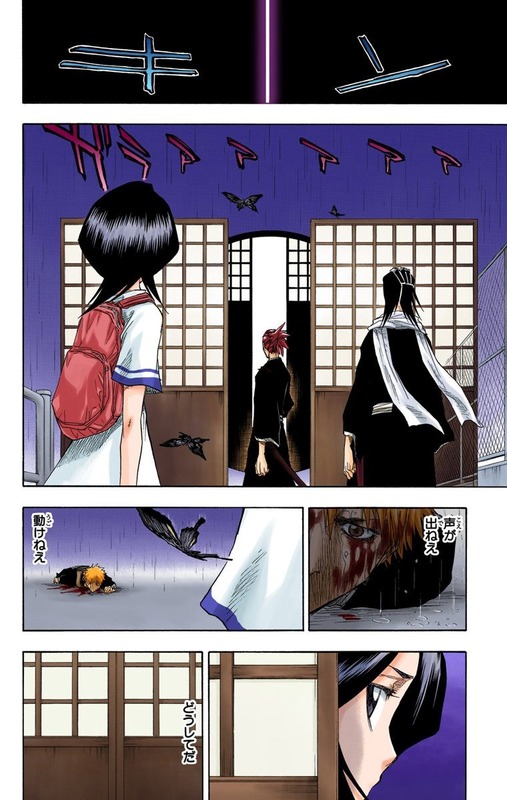 Ichigo watches heplessly in the rain as Renji, Byakuya, and finally Rukia walk through the portal, and the door shuts and fades away. He then rushes to Soul Society, the world of Soul Reapers, because Rukia is going to be executed for giving up the powers. The next major meeting of the characters happens when Ganjyu and Hanatarou come to rescue Rukia. 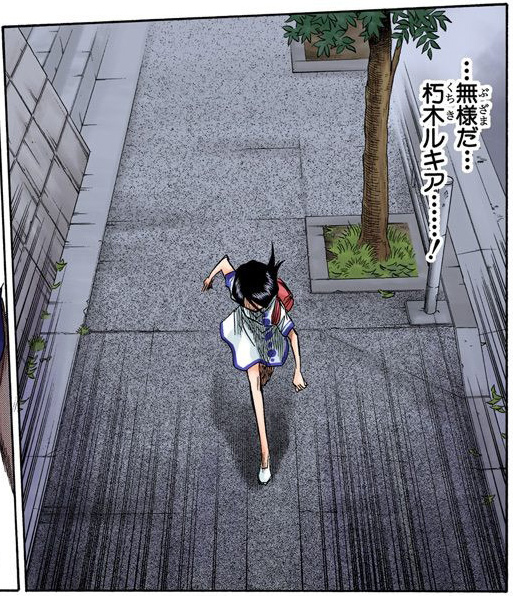 Outside the white tower Senzaikyu (懺罪宮; "Palace of Remorseful Sin"), Byakuya approaches the entrace to Rukia's prison to stop them. 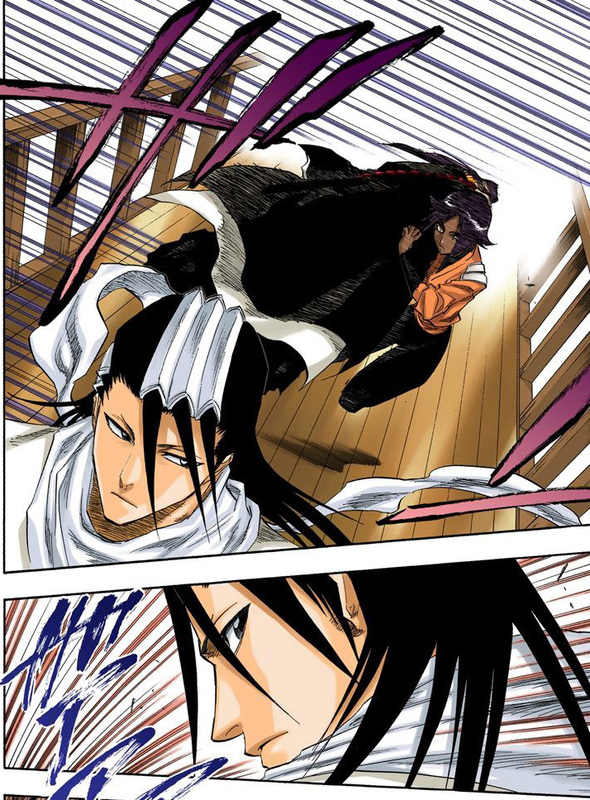 Ganjyu faces Byakuya on the bridge. Rukia tries to stop the fight, not wanting another member of the Shiba clan to die because of her, but being inside the Tower for so long drained much of her reiatsu and she promptly falls to her knees from the stress. 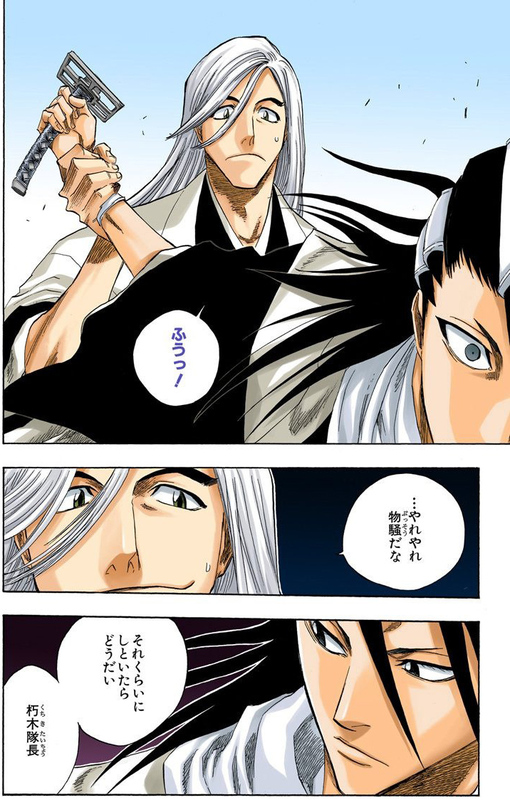 After a short bout, Byakuya slashes Ganjyu with his zanpakutou but Ganjyu still stands defiantly. However, when Byakuya hears that Ganjyu is from the Shiba clan, he apologizes for not fighting seriously enough and tells Ganjyu that he cannot let him leave alive. Byakuya raises his sword and murmurs, "Scatter, Senbonzakura!" His zanpakutou glows pink before seemingly dissolving to the hilt. 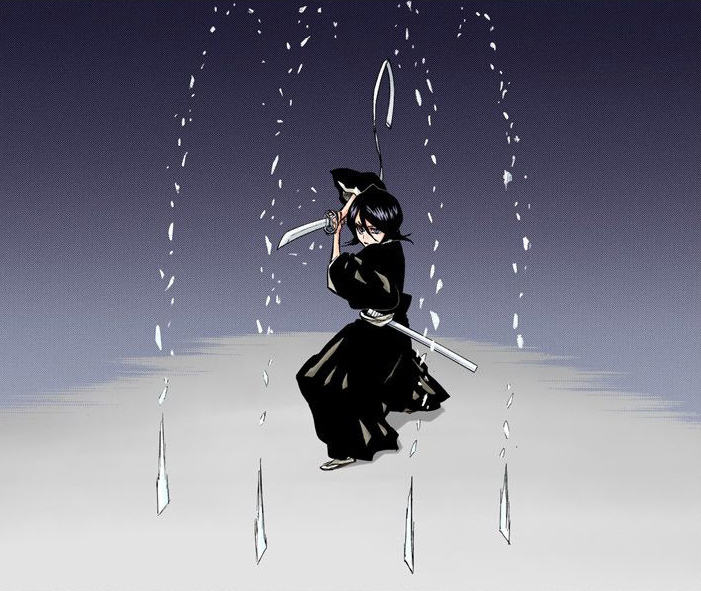 The small glowing pink "flower petals" swirl in the air and before Rukia can do anything to stop the attack, Ganjyu's entire body is sliced by the tiny, petal-like blades. A shocked Ganjyu falls to the ground, unmoving. Hanatarou looks on in complete shock. 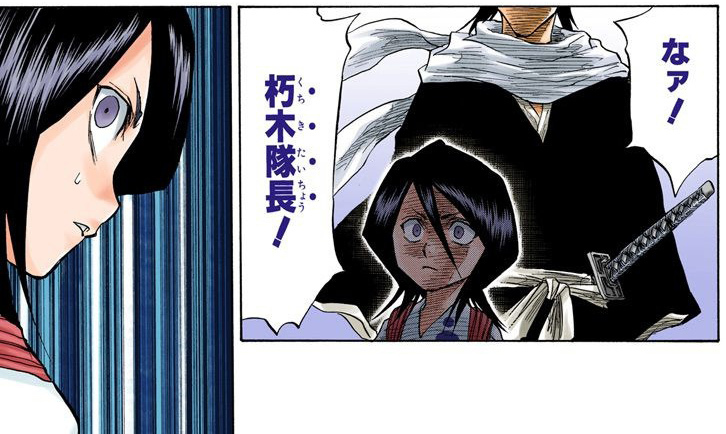 Byakuya takes notice of the fourth division shinigami but Rukia gains enough strength to stand in front of Hanatarou and beg her older brother to stop. Byakuya, however, raises his bladeless hilt, readying to attack as the tiny bits of his zanpakutou once again flutter in the air above. 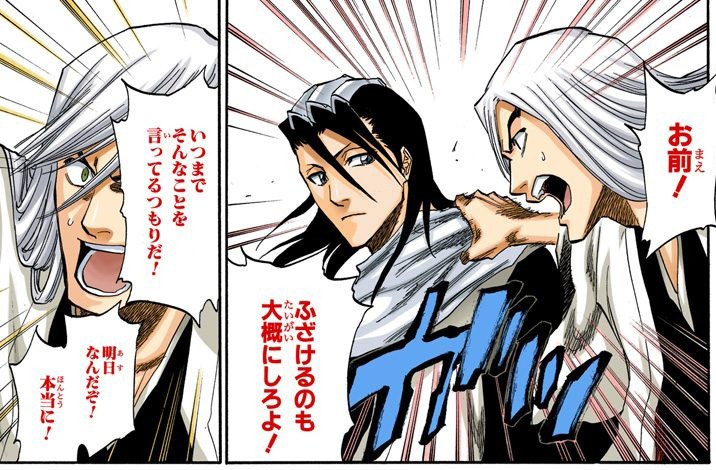 At the very last moment, a strong hand stops Byakuya's from going any further. Behind the sixth division captain is Ukitake Jyuushiro (浮竹 十四郎), the thirteenth division captain. 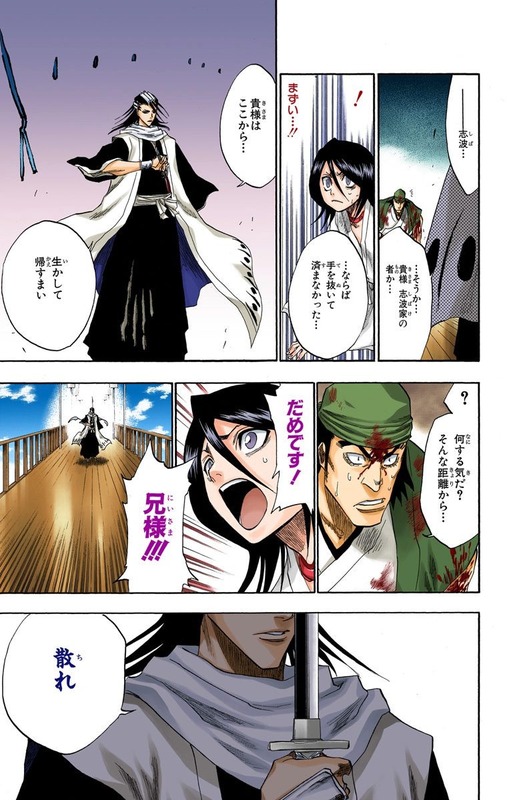 Ukitake requests that Byakuya halts his fight and then greets Rukia warmly. Byakuya then turns to Ukitake and asks what he is doing. Ukitake reprimands Byakuya, reminding him of that releasing one's zanpakutou in such a place is a class one forbidden act. 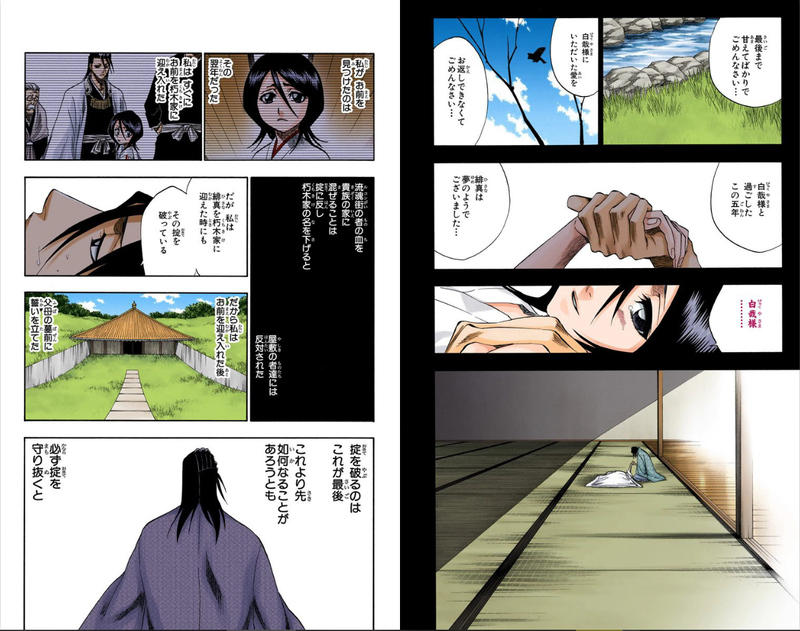 Byakuya informs Ukitake that a special wartime act has been enacted that allows the release of zanpkutou. Hearing this, Ukitake is surprised that the ryoka infiltration has become so serious and begins to ask if it was the ryoka who killed Aizen. However, before finishing his question, a large force of reiatsu is felt, one that Ukitake cannot recognize. Rukia, though, is perfectly able to identify its source and Ichigo quickly arrives at the scene, confirming her thoughts. He lands on the bridge, walks past a stupefied Rukia, and asks Hanatarou if he is okay. 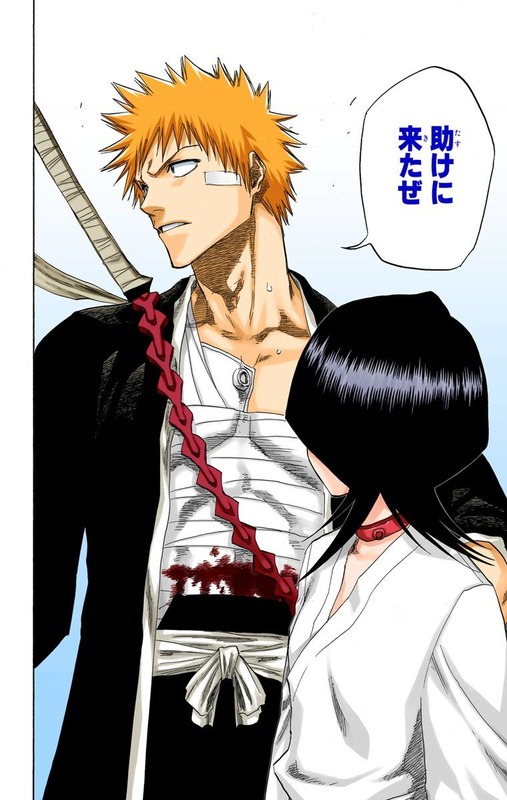 After Hanatarou assures Ichigo he is fine, Ichigo moves on to Rukia and tells her that he has come ot save her. 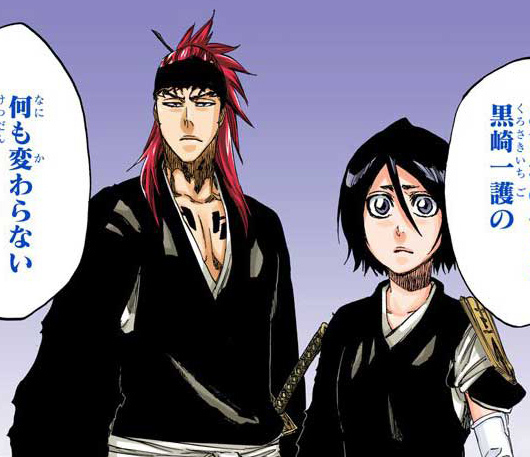 Rukia appears sad, and Ichigo becomes a little annoyed and exclaims, "What's with that look?! I'm here to save you! Act a little happier!" Rukia begins to break down in tears and tells him that he should have stayed in the living realm and that in Soul Society, he had become severely injured. 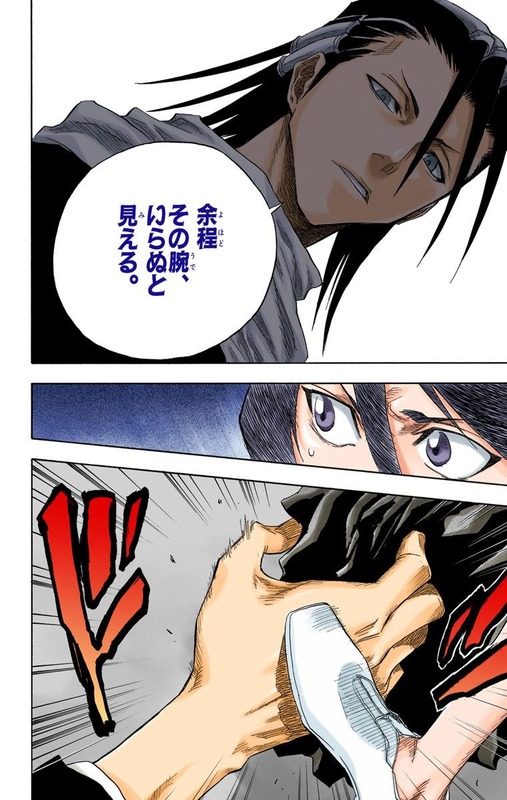 Turning away and looking and Ganjyu and then Byakuya, Ichigo tells Rukia that she can yell him all she wants later, only after he has defeated Byakuya. 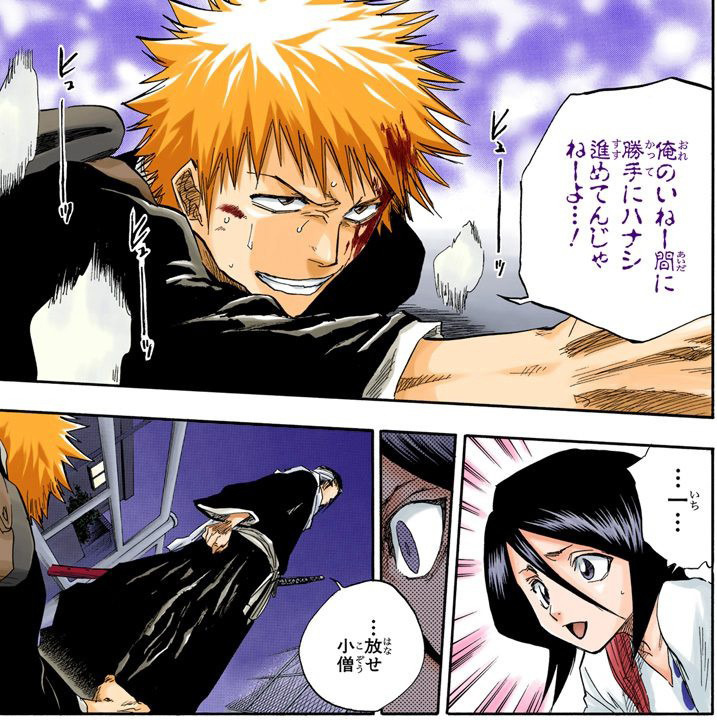 Rukia tries to stop Ichigo but he swiftly cuts her off and tells her that he won't back down for anything and that he will save her even if she wants to face the death penalty. Ichigo: From this point on, all your opinions are rejected! Got that, dumbass? Rukia: What the hell? You're ignoring all the rescuee's opinions? What kind of tyrannical way is that to save someone?! Ichigo: Shut up! The one being rescued doesn't get to complain! You just act the part and stand around and say, "Oh save me!" Suddenly, all the humour dries up two become serious. 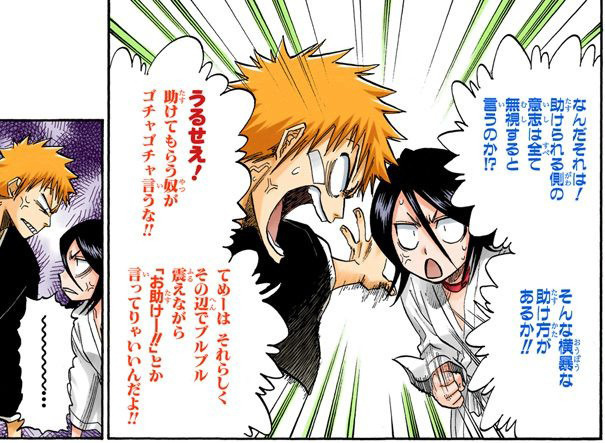 Rukia remarks that Ichigo hasn't changed at all and still refuses to listen to anything she has to say. Ichigo replies that's because she only speaks to worry about him. She should worry about herself more, especially in their current situation. 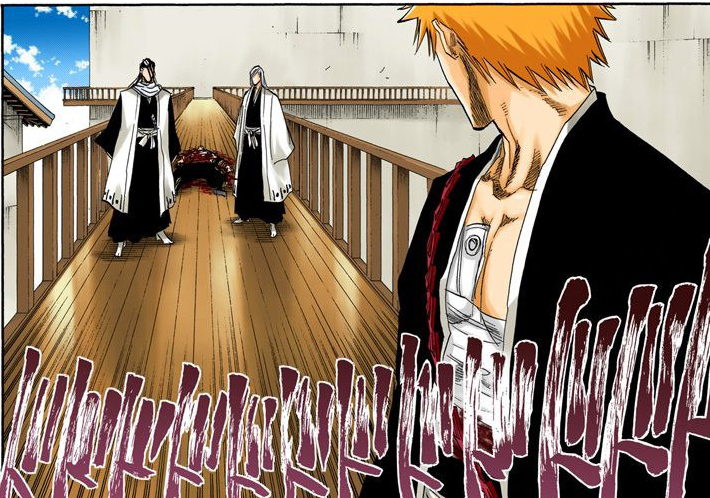 After stating that he will not die, Ichigo moves forward to face Byakuya. After a brief exchange of words, the fight begins as Byakuya tries to make the same move he made on Ichigo in the living world. Having gotten stronger since then, Ichigo easily deflects the attack. 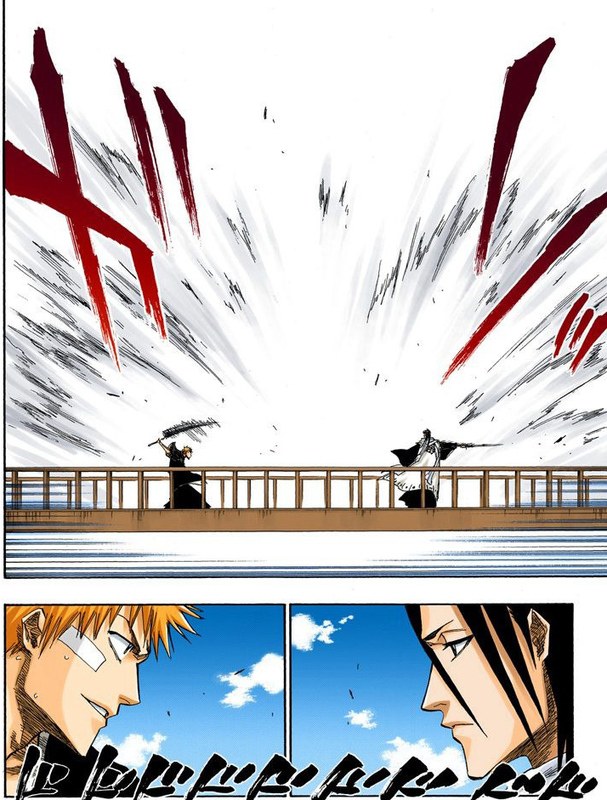 Ichigo asks if he is surprised at his increase in power and skill, but Byakuya remains nonplussed and tells Ichigo to not get overconfident because of one lucky strike. Ichigo takes this as a challenge and lunges forward but Byakuya disappears using his shunpo (fast walking) technique. Ichigo, however, has apparently learned much and is able to see the captain. He attacks but Byakuya easily blocks with his zanpakutou. Rukia watches the battle unfold. She herself is shocked at how much Ichigo improves but still worries, knowing that Byakuya has only shown a tiny fraction of his abilities so far. 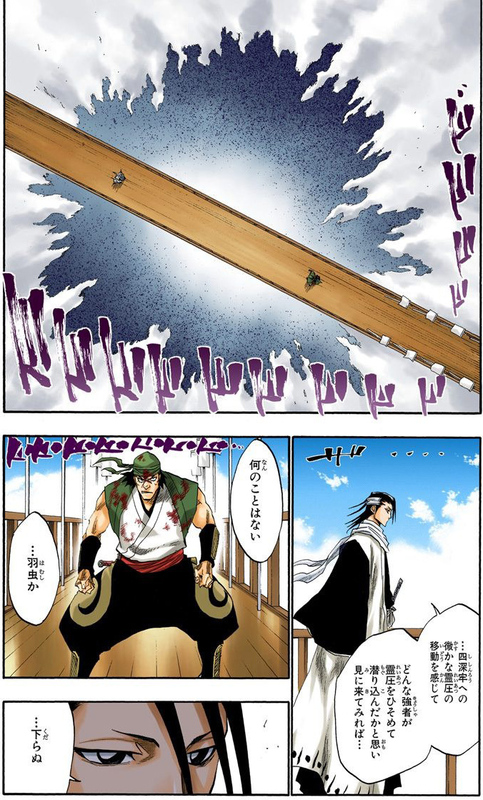 Byakuya also acknowledges Ichigo's dramatic improvement and raises his sword again in preparation for Senbonzakura. 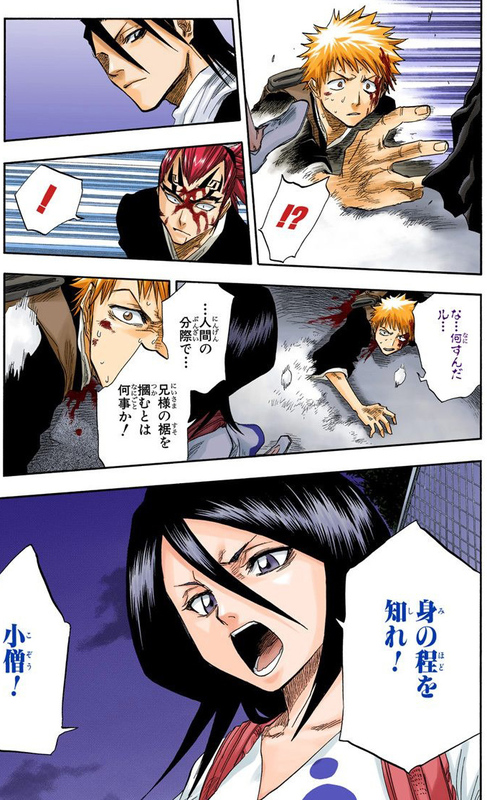 Rukia yells at Ichigo to run but Ichigo is completely clueless to what Byakuya is doing. Once again, however, the attack is stopped at the last moment. Byakuya's zanpakutou is bound by a long bandage before it can scatter into thousands of pieces, the bandage being held by none other than Shihoin Yoruichi (四楓院 夜一). 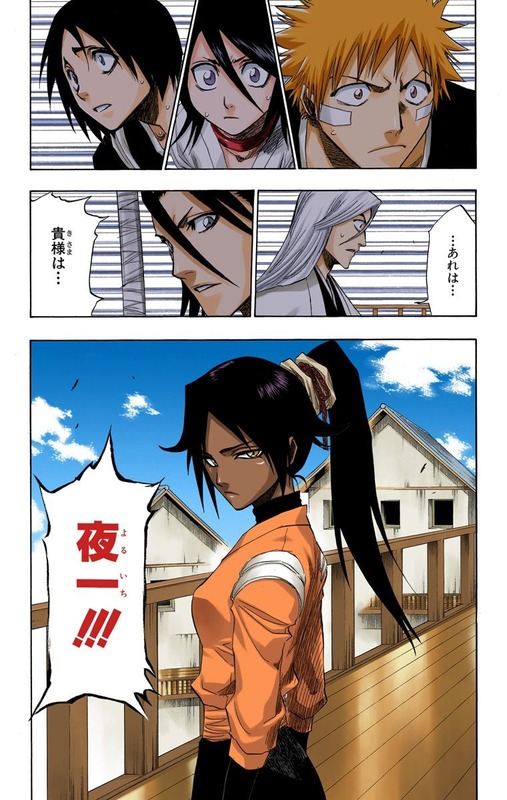 Yoruichi escapes with Ichigo promising to make Ichigo stronger than Byakuya in three days. Byakuya decides to leave, claiming that he's bored, and Rukia passes out. We enter Rukia's dream, and it is Rukia's first day as Shinigami. The other members of the division taunt her behind her back because she was adopted by the Kuchiki family. Vice-Captain Shiba Kaien ((志波 海燕) shows up and sends the whispering members off to work again. She greets him, and he gives her a hard time about her greeting, and after she greets him to his satisfaction, he asks for her name. Rukia is impressed at the fact that he treats her normally, unlike other people, who treat her differently because she is Byakuya's sister. Kaien then introduces himself, and mentions that Ukitake is sick a lot, so she can call him Captain by accident. 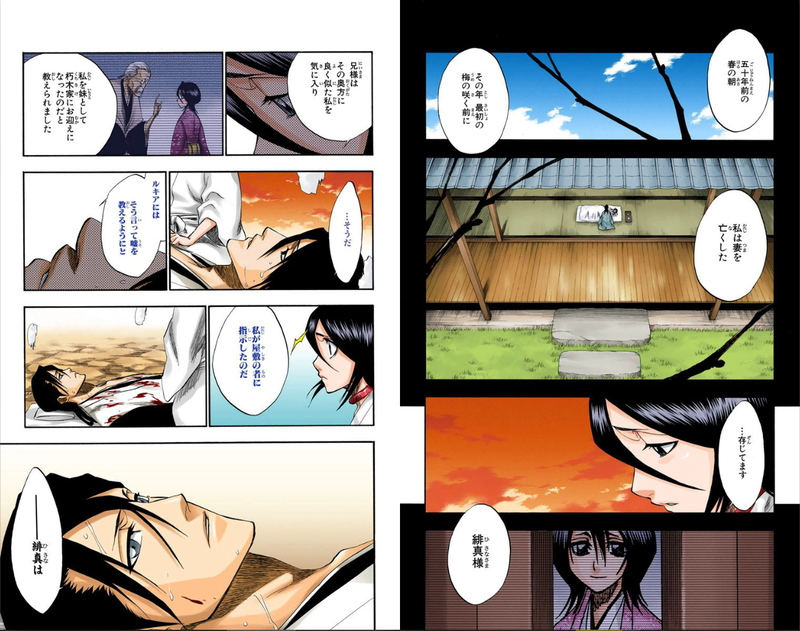 Later, Rukia meets with Byakuya, and tells him that she does not at the time have a seat because of her power. Byakuya is indifferent about her situation, and dismisses her. Then we get back to the present moment. 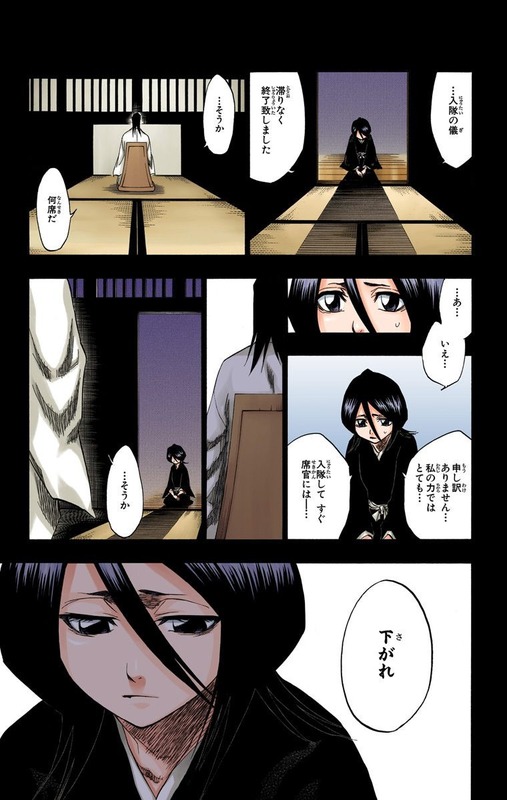 Ukitake catches Byakuya in a hallway and tries to make him feel bad for Rukia, but Byakuya is indifferent, saying that it will only shorten Ukitake's life worrying so, and that if she is to die, that is the way of things. Rukia's execution is an event taking place on the Soukyoku Hill. She faces execution by the Soukyoku (双殛; "Twinned Punishment") for her crime of transferring her shinigami powers to Ichigo Kurosaki. 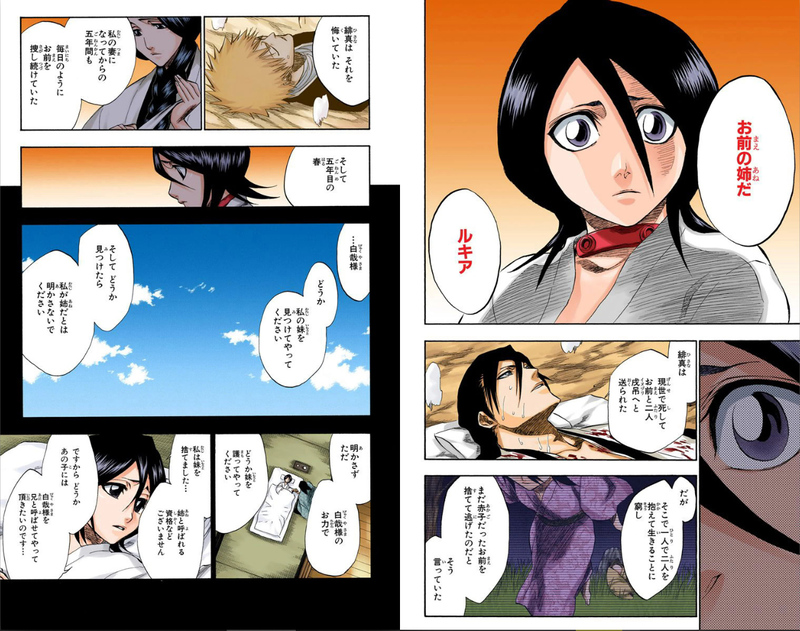 Rukia says to herself that she has become calm again, and will face death with no regrets. 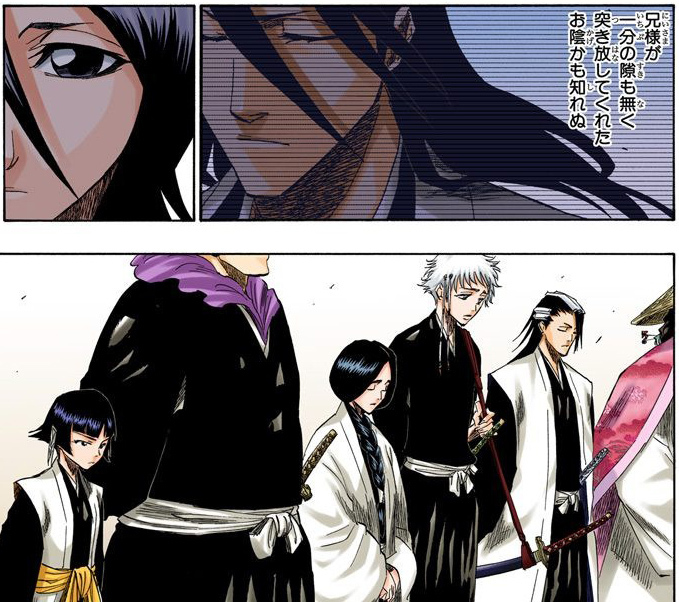 Byakuya is standing there too, indifferent. She is raised up to the stand as the true form of Soukyoku is finally released. 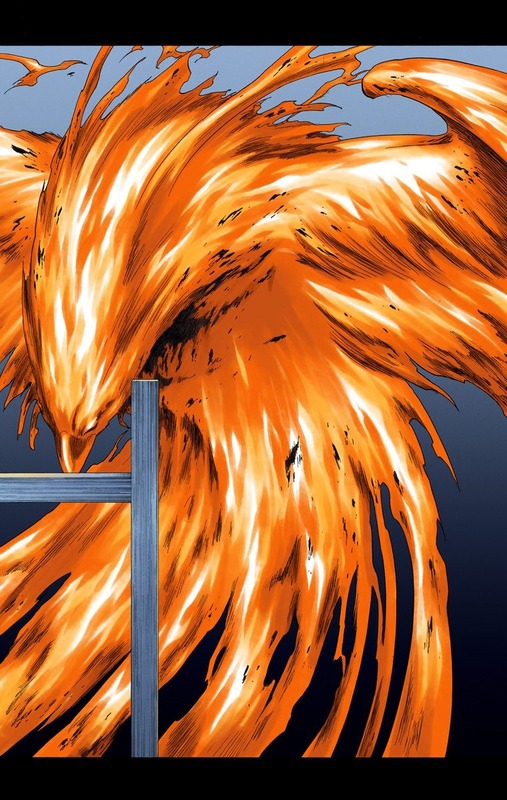 It is the form of a gigantic bird set ablaze. Genryuusai explains that this is King Kikou, the final enforcer of extreme punishment. Rukia says to herself that she is not afraid and has lived well. She thanks those close to her as well as those who tried to save her, and tearfully says goodbye as she thinks of Ichigo. As the episode goes to break, Rukia closes her eyes as the Soukyoku proceeds forward to end her life. All of the sudden Soukyoku stopped in front of Rukia. The crowd below gasps and is shocked to see that someone has blocked the Soukyoku’s attack. Rukia opens her eyes to see Ichigo in front of her. Ichigo throws Rukia down to Renji and tells him to protect her with his life. 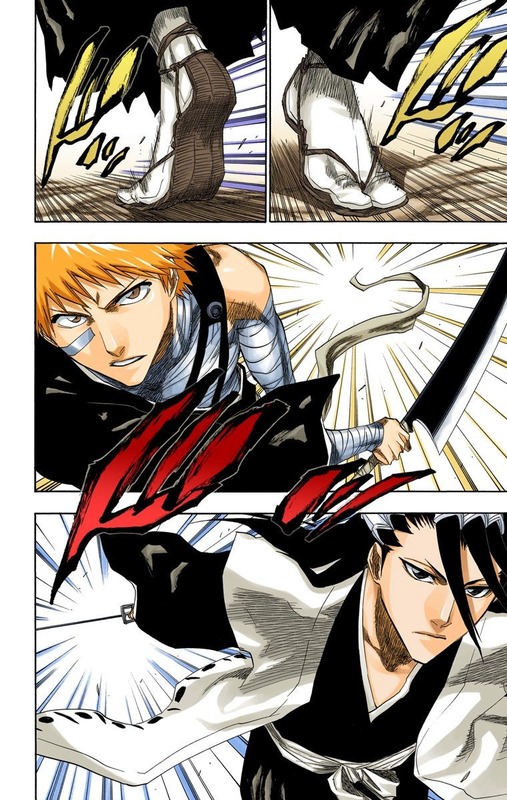 As he runs away, Byakuya runs up and clashes swords with Ichigo. 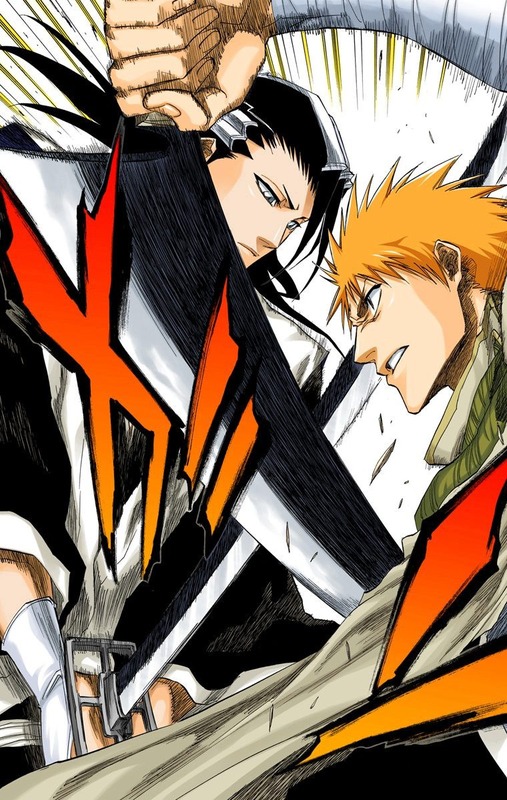 Ichigo tells Byakuya that he can see through his moves, as a decisive battle is about to unfold. As Byakuya and Ichigo face off, Byakuya asks Ichigo why he wants to save Rukia, but Ichigo counters with why Byakuya doesn’t want to save her. Byakuya decides that he’s just going to have to kill Ichigo and execute Rukia himself. 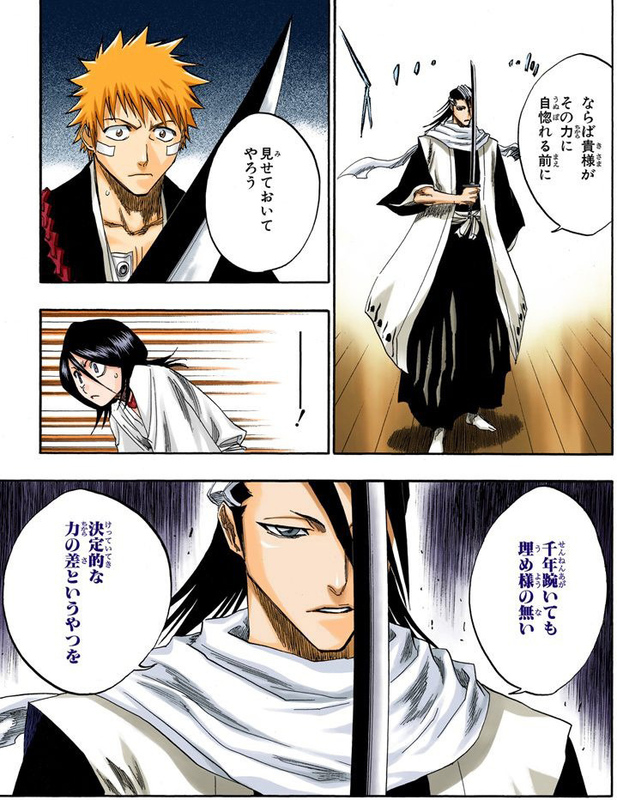 Before they cross swords again, Ichigo again asks Byakuya why he didn’t save Rukia. 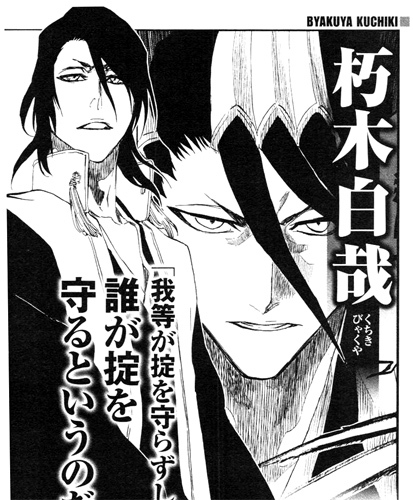 Byakuya promises to answer if Ichigo wins. 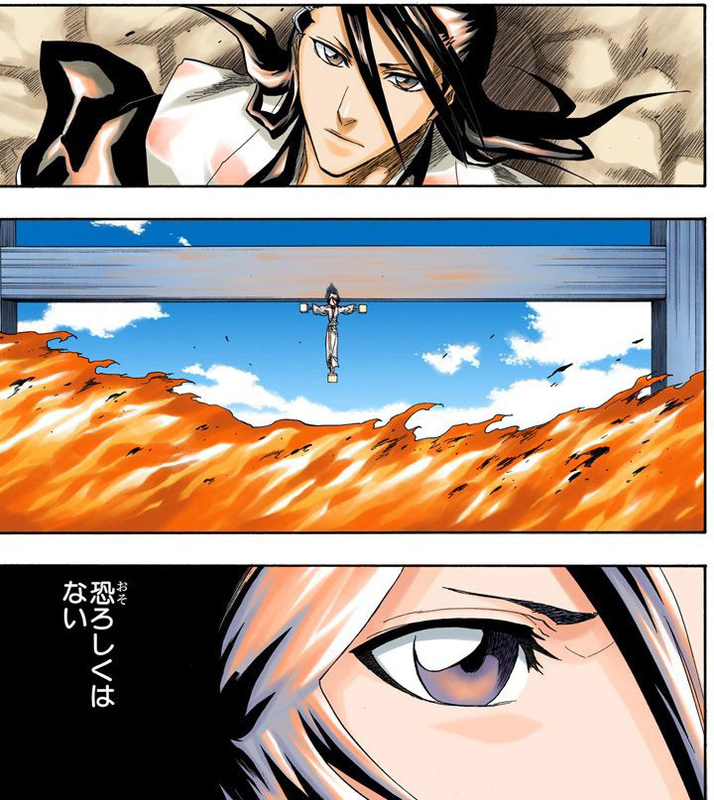 When the fight ends, to fulfill his promise, Byakuya explains that he allowed the execution to take place because the rules needed to be followed. 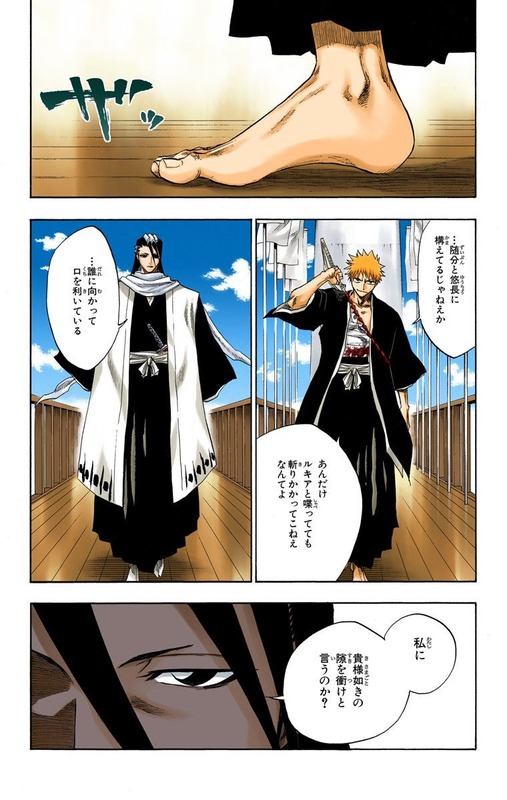 Ichigo says that he would have fought those rules, a statement that make Byakuya realize how much Ichigo was fighting the rules of Soul Society. 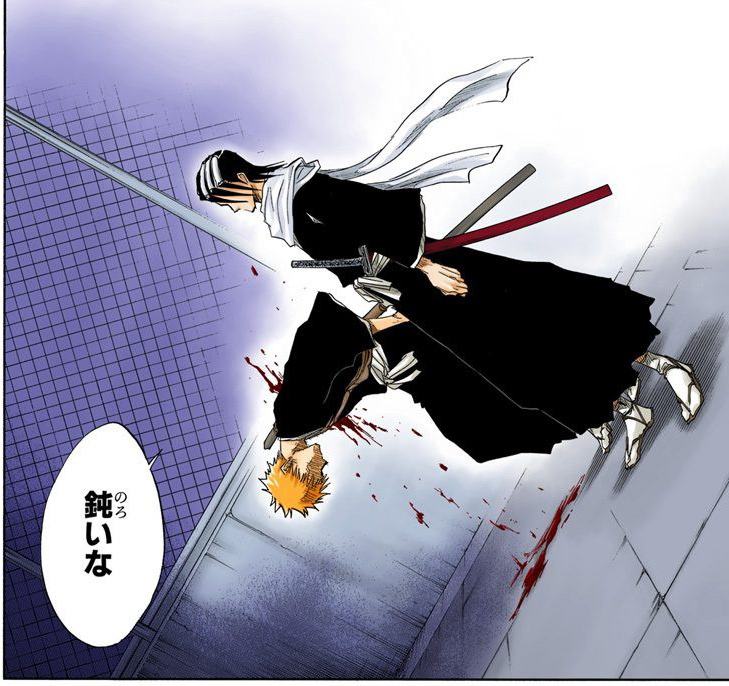 After Byakuya concedes the battle and leaves, Ichigo finally collapses. 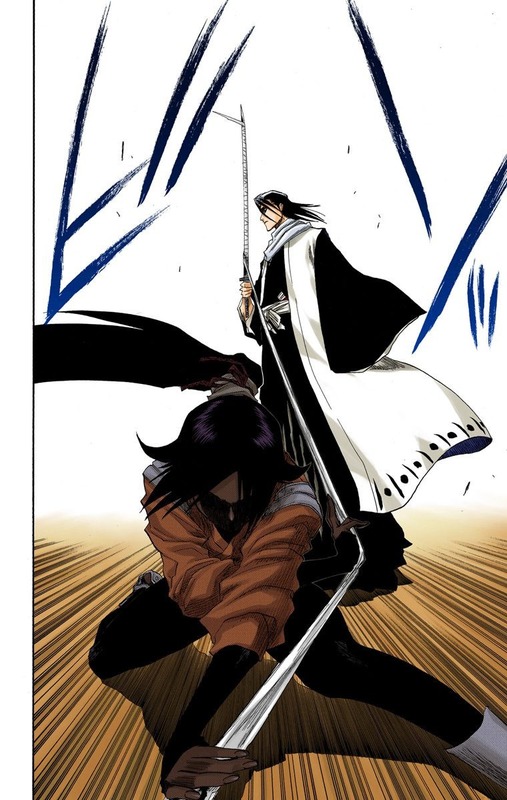 At the beginning of the series, at Ichigo's surprise, Rukia's death sentence is supported by her own brother, the head of one of the four great noble shinigami clans. Apparently Byakuya could have done something to lessen sentence, however, he acts very apathetic towards his sister, barely even looking at her, although she seems to idolize him to a certain extent. 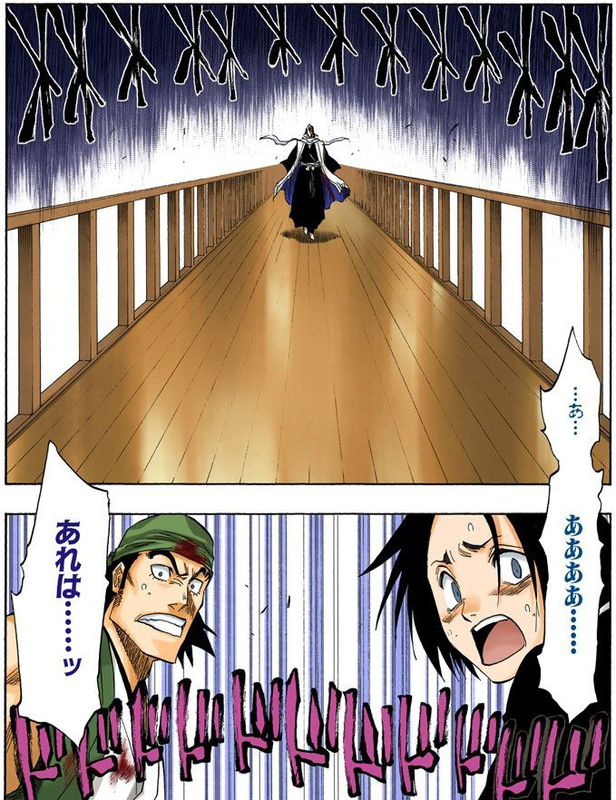 Renji is shocked to find out that Byakuya does not talk to Rukia and barely acknowledges her at all. After Ichigo saves her life, Rukia learns the truth about her brother and what she was actually the sister of Byakuya's wife Hisana. With the battle with Aizen over, the fourth division squads rush in to treat all the injured. Captain Unohana Retsu (卯ノ花 烈) arrives to see Inoue using an unknown healing technique on Ichigo. She herself goes to treat Byakuya, and then calls over Rukia so that her brother can tell her something. We get to see why Byakuya acted as he did. As explained in the chapter 179 of Bleach manga, in order to survive Hisana abandoned child Rukia on the streets of Soul Society. Hisana abandoned Rukia on the streets of Soul Society when they were young, as the responsibility of raising a child was too much. 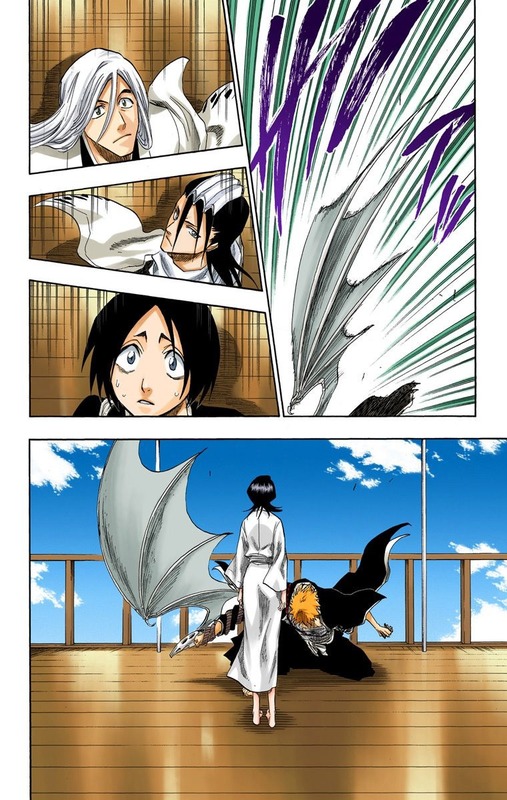 This decision was one that Hisana always regretted, and on her death bed she asked Byakuya to find her sister and use his power to protect her. She had implored to her husband, Byakuya, that he find and raise Rukia as his sister. Byakuya obeyed Hisana's deathbed request. He did this by adopting Rukia into the Kuchiki family, at which point he swore to himself on his parent’s grave that he would never again break any laws or overstep the bounds of nobility. His marriage to Hisana was looked down upon as she was not of noble descent. It was also frowned upon when Byakuya adopted Rukia into the Kuchiki family. So he swore upon his parents' graves that he would never break the rules again, no matter what, therefore he did not interfere with Rukia's death sentence. When Rukia was sentenced to death, Byakuya had to decide on protecting her or following the rules, and it’s clear which choice he made. 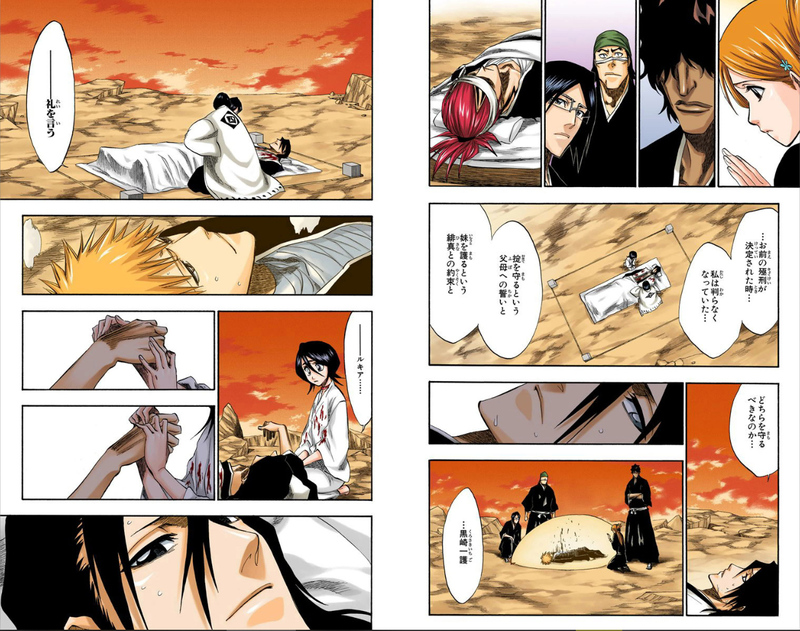 Because of that, Byakuya expresses his gratitude towards Ichigo, and apologizes to Rukia. Ichigo’s interference saved her. After said events and Rukia's rescue, their relationship improves greatly, and two of them show deep concern towards each other.